weekend. Actually it should have been a weekend of celebration my oldest daughter turned 20, and though I was happy for her. I do have to say that I was going through some emotional rollercoaster ride. I think all the stress has finally gotten to me. My plans were to be part of an online crop, and unfortunately I didn't do anything scrap related until Sunday morning that I had to have my DT layout ready for Scrapping the Music Blog. It took me 40 minutes to create, which is a big surprise. I am not a fast scrapper at all. If you look at the photo you can see in my eyes that I haven't slept. It's bad when the mind starts to play games with me. My husband looks great in the photo and though I am smiling, I am stressing. Poor man I made him take a shower Sat. as soon as he walked through the door because I needed that picture. As always he complies, and looked incredibly handsome. How do men do it. I mean can you tell that he was working a 12 hour day by that photo and that he was tired, nope nada. Meanwhile I hadn't slept and boom right on the face, those bags. LOL. Well here's my layout for Scrapping the Music, the song this week is one of my favorites it's by Alicia Keys titled No One. I have to say happy Thursday, but I'm only happy because it's just one day away from the weekend. I am going to be at AC Bailey Designs, this weekend. They have an online crop, and quite honestly I want to win some stuff. I also want to be inspired by their awesome Designers. I am currently working on submitting some projects, wish me luck. Believe me if I get an email you will all be first to know. That is my goal this year, to create and submit. Oh and don't forget there is only a few more days for the DT call on Simply Obsessed, you have until the 29 th of this month to submit. Ladies I can't believe that it has been 6 mos already. It's funny when you work with a group of fun ladies and a really fun MB time just flies. Simply Obsessed is having there DT call come and check out this awesome board. The ladies are awesome, friendly and definitely inspiring. Come say hello on the Message Board. 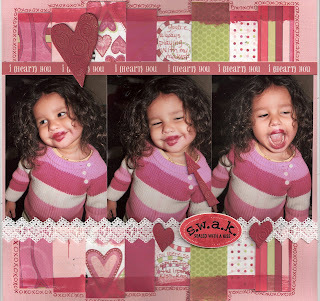 Be sure to check out the kit for February while it's still available. Here's a photo! It's flying of the shelves, LOL. Don't forget to tell them you heard about the call here. 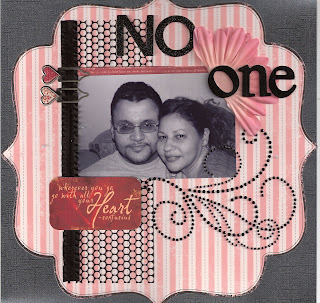 On my I love you layout I used it on the grungeboard hearts, and on my art work I used it on the big circle! 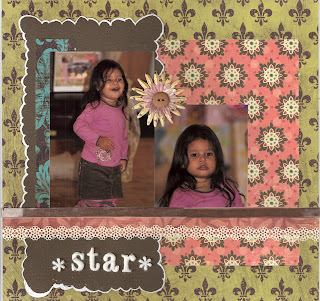 Okay so I purchased the Glimmer Mist from Tattered Angels, this is the new craze in scrapbooking. I love the colors I purchased which where the bronze and the candy apple red of course being that red is my favorite color. Well I have mixed feelings about it. I love the way it looks in the bottle, I tried it on regular paper before putting it on a layout and I loved it. Of course I have to now try it on my layout, and though I love the one side I used with the mask, I just don't like the other side without the mask. I love that it glimmers, I hate the splat look. So has anyone else ordered it, if so tell me what you think and how have you used it. I would love some ideas. 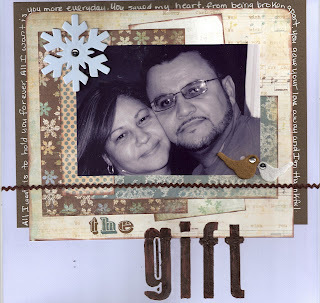 I did check out, Vicki Chrisman blog and I love what she has done with it. 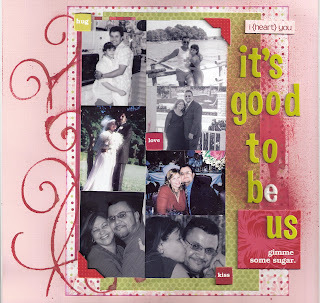 Here is my layout for Scrapping the Music blog the song this week is Good to be us by Bucky Covington. Oh and by the way this is also the layout using the glimmer mist in red. Yes I know I'm a week late, but so much going on. We had a quiet New Years Eve, I was scrapping while the ball dropped. Felt so good to stay at home and do something for fun. Emily and I were the only ones awake for the New Year. Everyone else was sleeping. Peace and quiet. If only the rest of the year could be this way. 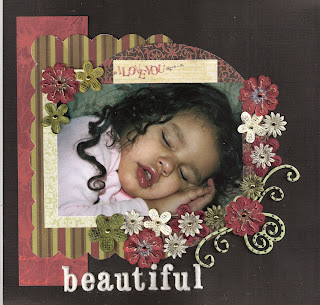 LOL Here is my layout titled beautiful that I created that evening titled Beautiful. 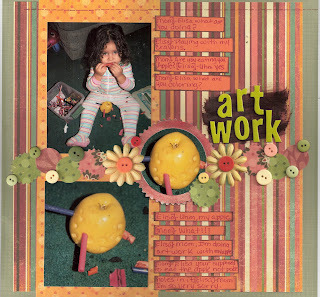 Here are my DT projects for Treasured Scrapbooking I loved working with this kit, stay tuned on the 15th we have our second reveal. Also check out the January contest, awesome prize!!!! 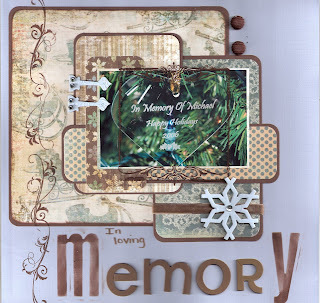 Simply Obsessed January kits are from MME Frost collection beautiful blues, and browns. 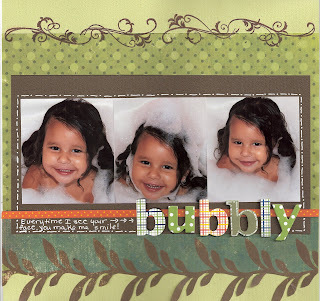 Also over at Simply Obsessed they are following the Big Picture Scrapbook 31 day layouts. Come and check us out.